This will result in a fast take off of the decarbonisation process, as low-carbon fuels (including renewable and e-fuels) can leverage on current engine technologies, also in combination with future hybrid solutions. Moreover, these types of fuel can show immediate and positive benefits in lowering CO2 emissions from the circulating fleet. 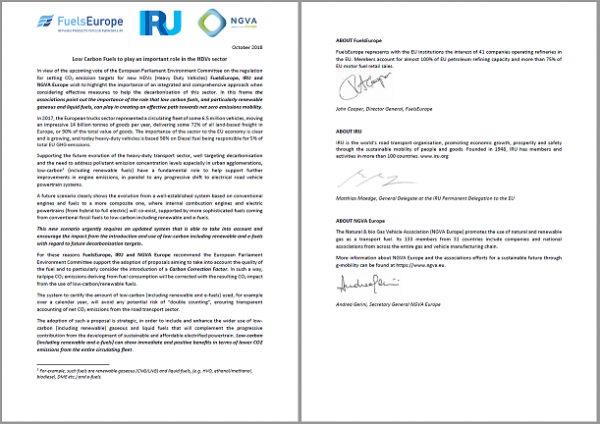 For these reasons, FuelsEurope, IRU and NGVA Europe urge the European Parliament Environment Committee to adopt the introduction of a Carbon Correction Factor (CCF) in order to start taking into account the quality of the fuel.